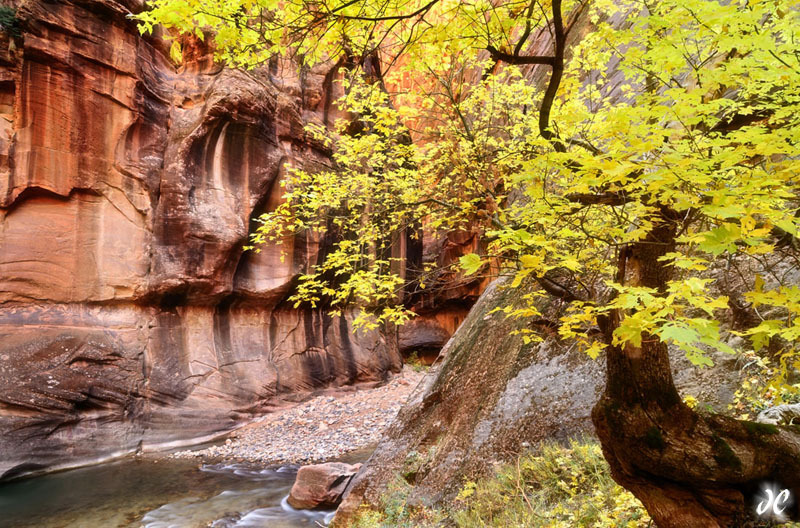 Zion National Park in Southern Utah is pretty darn beautiful. The towering rock walls remind me of a red Yosemite. The first time I visited the park in January 2010, ice and snow blanketed the ground and many of the hikes were inaccessible or dangerous to do. But one of the most iconic hikes in the park, The Narrows, was open so I decided to give it a whirl. But I was unprepared for the nature of the hike and consquently spent 8 hours in 40 degree water. Brrrrr. An enjoyable day, but thoroughly freezing. So when I had the chance to visit Zion again in 2011 ago I made sure everything would be different: first off, I planned my visit for the Fall, before much snow had a chance to accumulate and before the temperatures would get really cold. Secondly, I decided to rent a full-body suit to keep my warm and dry during my hike up the Narrows. And what a difference it made! Now I could stand in the chilly water all day without getting wet, enjoying the sights and wonder of the Narrows without worrying about hypothermia. Which of course made it a lot easier to focus on photography. I found this beautiful tree about 30 minutes into the hike, perched on a hillside overlooking the Virgin River. The yellows of its leaves were positively glowing and the contrast they made with the soaring red rock walls was wonderful. I made many photos during that hike of the Narrows, but this quickly became one of my favorites.